Don’t you just love a pasta salad that is chuck full of ingredients… instead of JUST pasta? 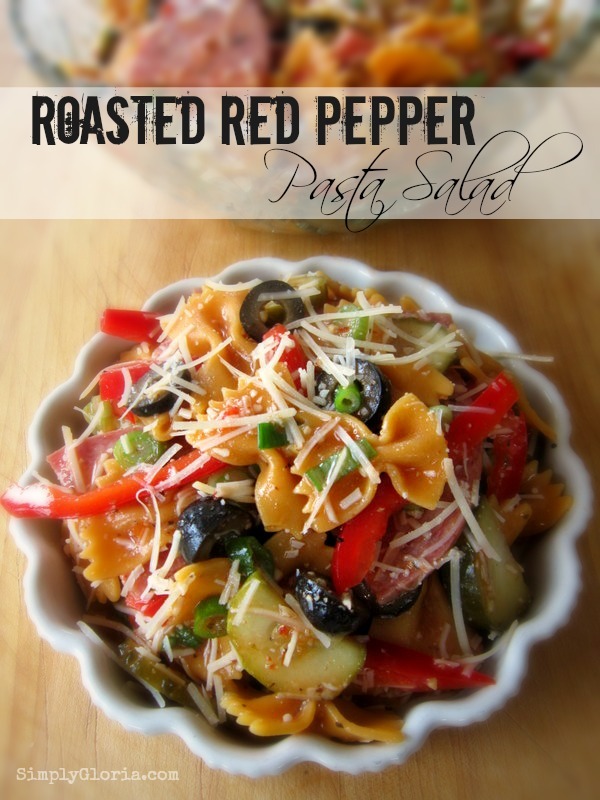 This Roasted Red Pepper Pasta Salad is filled with pieces of salami and crunchy vegies. But we can’t forget about the cheese. It’s sprinkles with fresh Parmesan! This salad is perfect to bring with you for gatherings this summer. I mean, look how colorful and fun this salad is! It’s super easy to put together. I love using the bow tie pasta (made with carrots and squash). Full of flavor and it just makes it pretty! By using the bow tie pasta, it tends to help hold up with all the ingredients when you pick it up with your fork. One of the other main ingredients, the dresssing, is just a bottle of (Kraft) Roasted Red Pepper Salad dressing. It truly gives this pasta salad bit of a zing! Toss all the ingredients together and let them be merry for an hour in the refrigerator before serving! 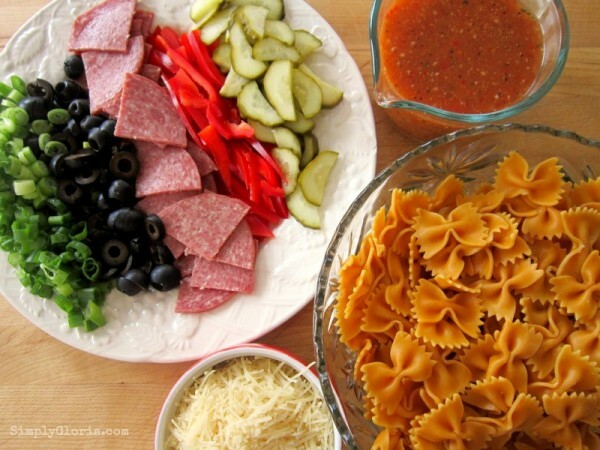 There you have a fresh, delicious pasta salad busy with all the happiness! Super easy to toss together for any gathering! Can easily be doubled. Good for 2 to 3 days stored in the refrigerator. Cook pasta and drain with cold water. Set pasta aside to get any excess water off. Add all ingredients together, including dressing in a large bowl and stir. Sprinkle half of Parmesan while stirring. Add the rest of Parmesan on top of pasta salad. Can store in a container with lid in the refrigerator for 2 to 3 days. 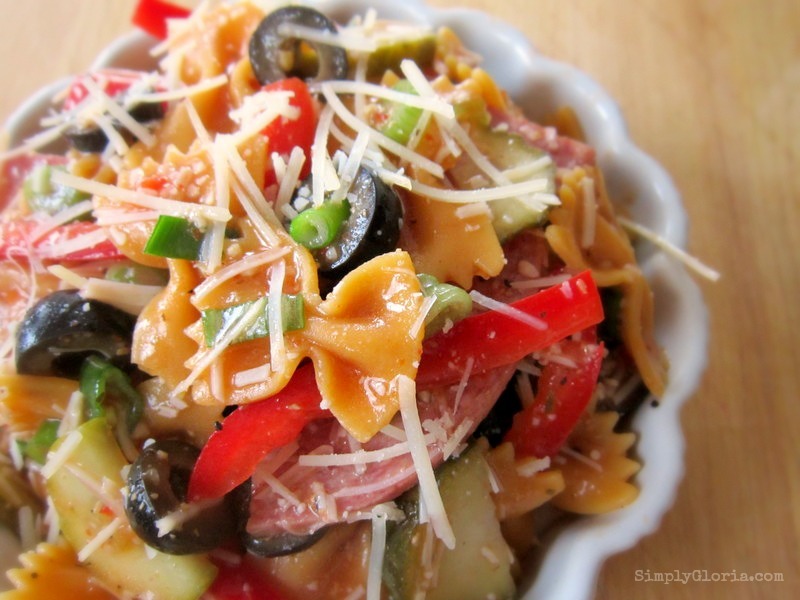 there is so much going on in this pasta salad and I am digging it! I love a lot of “stuff” in my salads – both with lettuce or pasta. This is a must make Gloria! sally @ sallys baking addiction recently posted…Triple Chocolate Layer Cake. Um!!! Yes please, this looks awesome!!! Love roasted peppers. Sugar et al recently posted…White chocolate and Macadamia Caramel Cookies. MMM pasta salad! Love and when we make it at our house we use a bottle of salad dressing too! I love all the ingredients- in pasta salad more is better! Gloria, looks and sounds delicious! Pinning and have a happy Tuesday! Thanks for the PIN action, Cindy! Happy Tuesday back! I am totally making this next weekend! I have a feeling this will be my new “go to” pasta salad! Oh my goodness. This looks fabulous! I think I might have to make this this weekend. I want to grill burgers and this would go perfect with them! Pinned to my food board! This pasta salad is always a perfect side for burgers! LMK what you think, Julie! Have a fun rest of the week! Ohhh…outstanding! I want that for lunch! It’s so delish! Thanks, Tonia! And thank you again for the feature the other night! This sounds so amazing! It would be a great idea for a summer picnic. Yum! I love taking this pasta salad to picnics…and sometimes camping! I just pre make it the day we leave…and we eat it all through the weekend! Thanks, Holly! Thank you, I think I’ve found my new go-to summer potluck and BBQ dish. This looks so good! I’ve pinned it because I’m certain I’ll be making it soon! We go through so many bowls of pasta salad every summer!! This looks like a fabulous recipe and I can’t wait to try it out!!! It seems you just can’t have a summer picnic/BBQ without pasta salad! Thanks, Jocelyn! Hope you’re enjoying your Monday so far! I just started making recipes with bows! LOVE THEM!! I will try out your recipe for sure! Christine, don’t you just love the bow pasta! I’ve been hooked on these new veggie ones! LMN when you try this salad…you’ll love how easy and simple it is to throw together! Hope you’re enjoying your monday! Gloria- this salad looks awesome! Perfect for Summer picnics; saving this to make soon! 🙂 Thank you so much for sharing this with us last weekend! You are a Featured Favorite on Saturday Show & Tell on Cheerios and Lattes this weekend! We love having you join us and can’t wait to see what you’ve been up to this week! Have a great weekend! Yah!!! Thank you so much, Mackenzie! You are such a fabulous hostess! LMK when you try the pasta salad…you’ll love how easy and fast is to throw together! It’s definitely a crowd pleaser! Seriously girl, i can’t look through this site without totally salivating! My fam loves it when i make your recipes (I take full credit for all of them of course 🙂 Im making your roasted red pepper pasta salad tonight, cant wait! keep the salads coming, theyre the best for summer! Youre amazing!!!! You just made my whole day, Bambi! Can’t wait to enjoy this salad, looks delicious and it’s a gardeners dream! It’s right up your alley! Thanks, Pamela!